Memory sequencing reveals heritable single cell gene expression programs associated with distinct cellular behaviors. Shaffer SM, Emert BL, Sizemore AE, Gupte R, Torre E, Bassett DS, Raj A.
Validation of a next-generation sequencing oncology panel optimized for low input DNA. Gene expression distribution deconvolution in single-cell RNA sequencing. Wang J, Huang M, Torre E. Dueck H, Shaffer S, Murray J, Raj A, Li M, and Zhang NR. SAVER: Gene expression recovery for single-cell RNA sequencing. Huang M, Wang J, Torre E, Dueck H, Shaffer S, Bonasio R, Murray JI, Raj A, Li M, and Zhang NR. 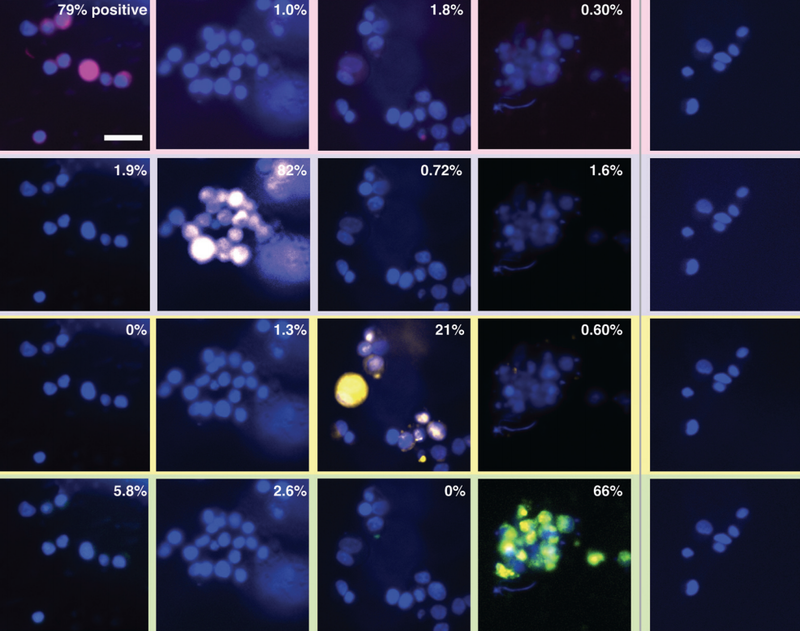 A slow cycling subpopulation of melanoma cells with highly invasive properties. M Perego, M Maurer, JX Wang, S Shaffer, AC Müller, K Parapatics, L Li, D Hristova, S Shin, F Keeney, S Liu, X Xu, A Raj, JK Jensen, KL Bennett, SN Wagner, R Somasundaram, M Herlyn. Rare Cell Detection by Single-Cell RNA Sequencing as Guided by Single-Molecule RNA FISH. Torre E, Dueck H, Shaffer S, Gospocic J, Gupte R, Bonasio R, Kim J, Murray J, Raj A. Rare cell variability and drug-induced reprogramming as a mode of cancer drug resistance. Shaffer SM, Dunagin MC, Torborg SR, Torre EA, Emert B, Krepler C, Beqiri M, Sproesser K, Brafford PA, Xiao M, Eggan E, Anastopoulos IN, Vargas-Garcia CA, Singh A, Nathanson KL, Herlyn M, Raj A.
Transcriptional Bursting Explains the Noise-Versus-Mean Relationship in mRNA and Protein Levels. Dar RD, Shaffer SM, Singh A, Razooky BS, Simpson ML, Raj A, Weinberger LS. Multiplexed detection of viral infections using rapid in situ RNA analysis on a chip. Shaffer SM*, Joshi RP*, Chambers BS, Sterken D, Biaesch AG, Gabrieli DJ, Li Y, Feemster KA, Hensley SE#, Issadore D#, Raj A#. * equal contributions, # corresponding author. Turbo FISH: A method for rapid single molecule RNA FISH. Shaffer SM, Wu M, Levesque MJ, Raj A.